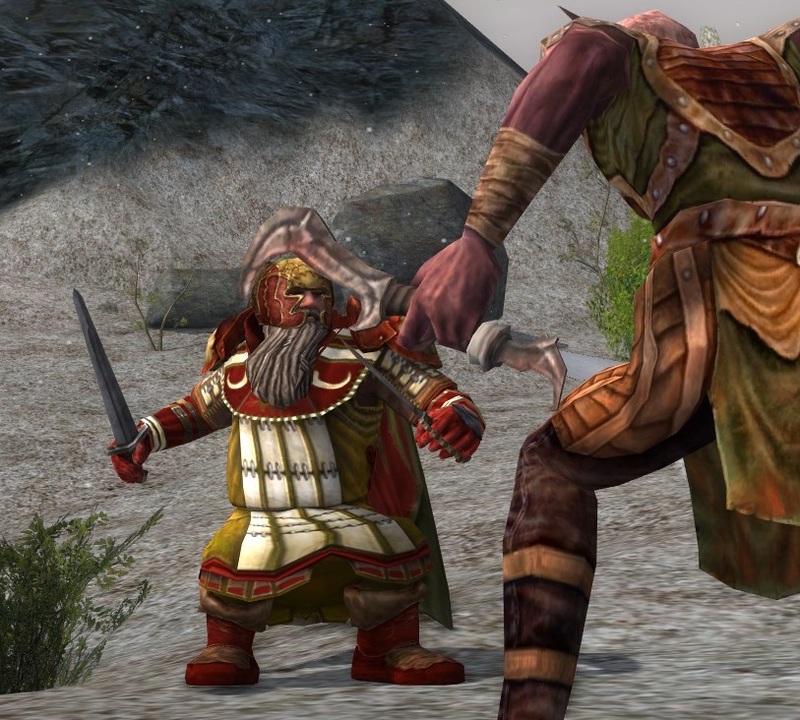 This old Dwarf is bold. He stands proudly in front of snow and stone alike in his blood-red helm and armour to match. Does a goblin seek to aim its spear? Let it! The Elder has no patience with foes who hide. I used this helm as an example in my Friday Poll about HATS, and it hasn’t been far from my outfitting mind since. 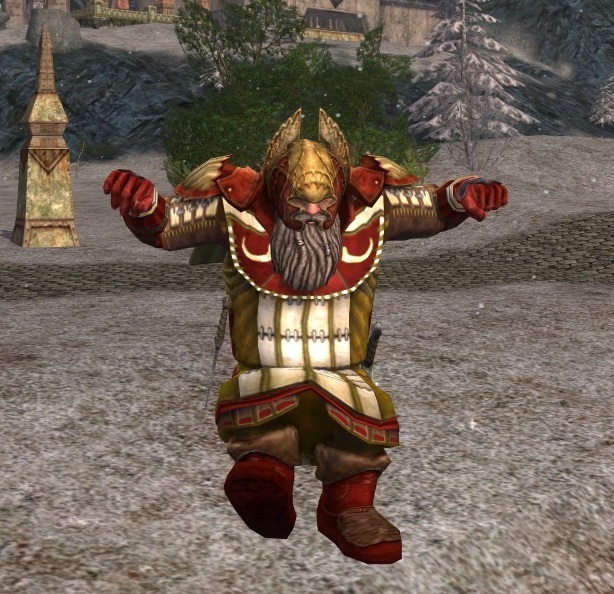 Dwarves can handle a whole lotta helm. 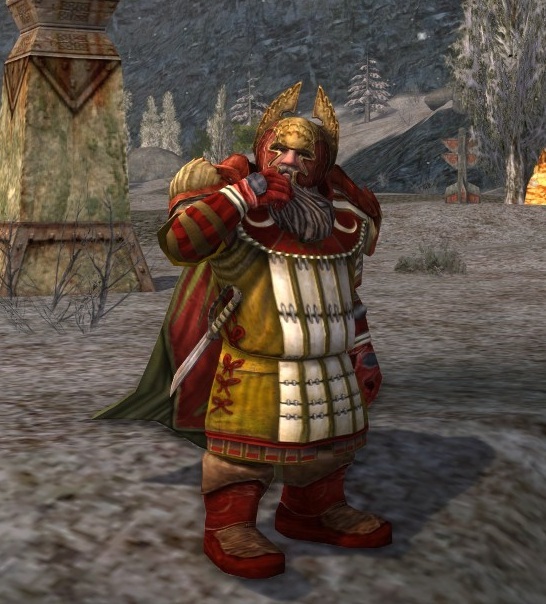 They’re broad, brawny, noble sorts, and if any of the races in our beloved Tolkien mythos can handle helms and pauldrons with spikes sticking every which way, it’s Dwarves. In real life, I am a cat lover. I always feel bad bashing lynxes in game. 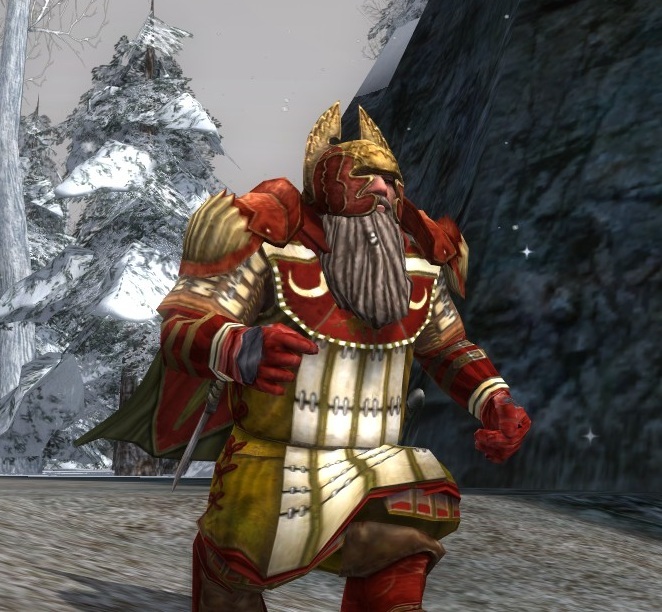 The primary pieces in this outfit are the Barrow-scout’s Helm, Shoulder Pads, and Boots, all medium armour, and all available at the “Classic” armour vendor in Skirmish camps. They’re inexpensive, as classic armour sets go: only 77 marks each, plus six medallions. 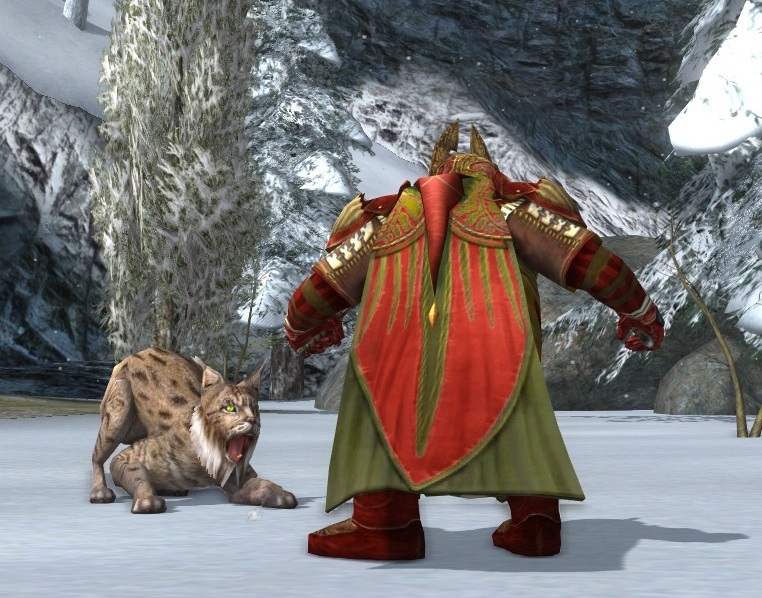 The Scout’s Hauberk and Twilight Cloak, both dyed red, assist. I am not a goblin lover, though, so these are safe. Tomorrow, a new House and Home! A great helm for such a sturdy dwarf. 🙂 I love the twilight cloak, but I have a hard time using it. I’ll start an outfit around it and by the end of my process I’ve switched it out again. Yeaaaah, I went back and forth. It is NOT my favorite at all. I think the greenish-brown on it is a little too muddy for me. Oms, I hate fighting the lynxes as well. Yay cats! And yay, hauberks!! 😉 The way you matched the colors in this one is fantastic. You owned this hauberk, and it’s a tricky one. I find this cloak a bit muddy (good word!) too and it doesn’t dye all that well. However, it’s a beautiful design, kudos for sticking with it and including it with this outfit.